At Cardinal Newman, Religious Education is about the development of an open-ended, ‘thinking’ approach to primarily the Catholic tradition, supplemented with ideas from other Christians, followers of other world religions, and secular groups. Pupils follow the Diocesan programme of study for secondary RE in KS3 which has been modified to reflect the distinctive character of our school. 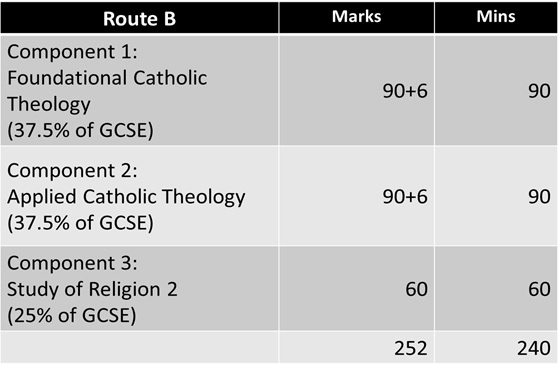 All pupils take GCSE Religious Studies as outlined below. RE is at the heart of our school. RE provides a safe environment and the sacred space in which students can explore questions of ultimate meaning. RE is a challenging academic subject. That all young people are intrinsically good. That we are called to bring meaning and hope into the lives of our young people. That we are called to help our young people discern their place in the world. Provides outstanding teaching and learning, which is academically rigorous, across all key stages. Is consistent with, and responds to, the needs of our young people and staff. Develops and fosters positive relationships rooted in Gospel values. Is not afraid to take risks. A welcome into our faith community. Our journey as pilgrim people. Jesus' mission, life and ministry. The Holy Spirit active in the world. Students complete summative assessments in Religious Education each term, along with the monitoring of students' classwork and homework. Assessments are tailored to enable students to be stretched and challenged. The core skills are instilled from year 7 and are intrinsically linked with GCSE. Students are taught to respond to command words; outline, state, explain and evaluate. Students are nurtured to become independent thinkers, develop their opinions along with being able to see a different point of view in order to evaluate. These skills are taught through a range of stimulating and innovative activities. In Years 9, 10 and 11 a more rigorous academic approach is followed, with all students following the EDUQAS GCSE Religious Studies course Route B. There are 3 linear exams at the end of year 11 with regular assessments and mock exams. Look at both sides of arguments to do with social teaching with your child, and ask them how they came up with judgements. Ensure our child knows their yellow ‘assessment structure sheet’ off by heart. Make sure that students have a quiet place to revise and that they have developed a revision timetable. Encourage students to attend after school sessions.